A happy new year to all of our readers! 2017 was pretty amazing for all of us at National Parks at Night. We led workshops at nine different locations in the United States and Iceland. 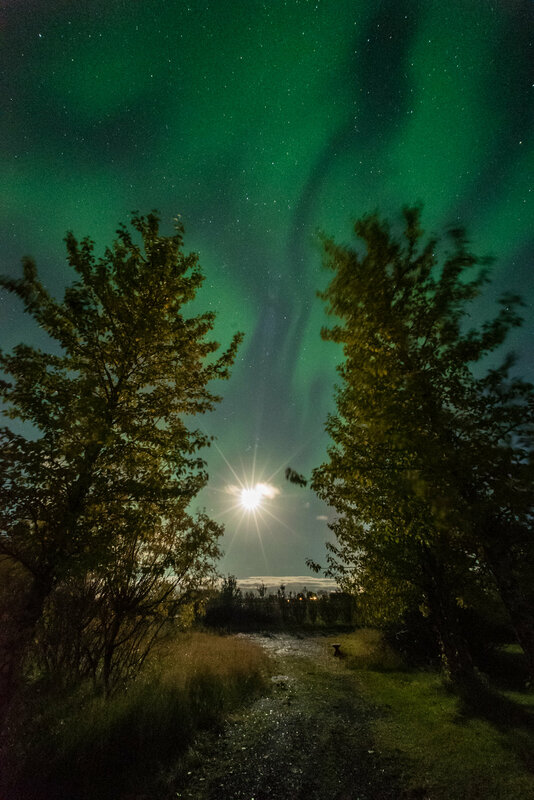 We witnessed auroras, the total solar eclipse, meteor showers, and billions and billions of stars. We hope that you join us for an adventure sometime soon. Whether you’re coming with us or heading out on your own, there are as many reasons to photograph at night as there are stars in the sky. Shooting any night can be, and often is, spectacular, but there are also some special dates to get outdoors with your camera, as there are scores of notable celestial events to photograph in 2018. You already know about many of these if you own a copy of our 2018 calendar, “Shots in the Dark,” where they’re marked conveniently for you! As for any specific times mentioned, we gleaned that information by using our favorite photo-planning app, PhotoPills. The approximate times in the list below are based on the U.S. Eastern time zone—so if you live elsewhere, we recommend double-checking the times in the planner section of PhotoPills. It also goes without saying that most of these celestial events are best viewed in dark sky locations—of which our National Park system has plenty! If you live in an area with high levels of light pollution and want to find darker skies, we recommend checking out Dark Site Finder. 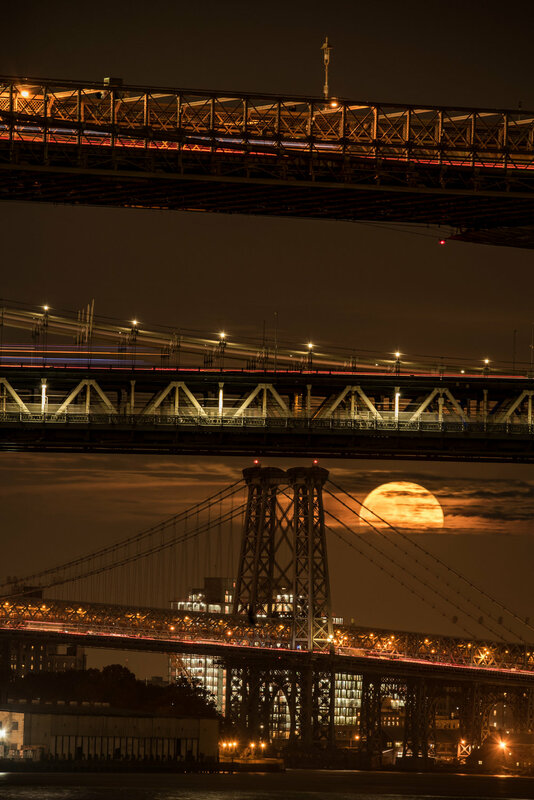 Supermoon through 3 Bridges. Nikon D750 and Tamron 150-600mm f/5-6.3 lens. 1/2 second, f/11, ISO 400. © Gabriel Biderman. Quadrantids is an above-average meteor shower with up to 40 meteors per hour at its peak, which lasts from the evening of January 3 into the early morning of the 4th. The field of meteoroids was produced by the now-extinct comet 2003 EH1, which was discovered in, you guessed it, 2003. The meteors appear to radiate from the constellation Bootes. Worth Shooting? This is a tough one. The full moon will make all but the brightest meteors invisible. If you are in a warm, dark sky location—why not? But in the north, we might sit this one out. Full Moon over Hudson. Nikon D700 and Zeiss 21mm f/2.8 lens. 2 minutes, f/11, ISO 200. © Gabriel Biderman. OK, lots going on this night. We will be leading a workshop in Biscayne National Park (still a couple of spots left! ), which will be a perfect location to view the supermoon rising over the forever horizon. We may even explore some reflecting moon trails as we explore this water world of a park. The total lunar eclipse will not be viewable in Biscayne, but will be in many other national parks and wild spaces in large parts of the world. If you live in western North America, eastern Asia, Russia, Australia or around the Pacific Rim, you’ll be in the path of totality. Taking a bite out of the Great American Solar Eclipse. Fujifilm XT-2 and 100-400mm f/4.5-5.6 lens. 1/250, f/8, ISO 800. © Gabriel Biderman. Winter is over and there will be equal parts of day and night … with the days slowly getting longer, boohoo! Full Moon through the Auroras, Iceland. Sony A7s and Zeiss 21mm f/2.8 lens. 15 seconds, f/8, ISO 25,600. © Gabriel Biderman. Our second blue moon in the first three months of the year. This is unique, as is the interesting fact that 2018 features no full moon in February. You’ll need to stay up late. Depending on where you are, the return of the Milky Way’s core to the night sky is reason to celebrate! It should break the horizon around 1:30 a.m. and hang around for three hours before the morning twilight erases the stars. Lyrids is an average shower that can have about 20 meteors per hour at its peak on the evening of April 22 and the early morning of the 23rd. The shower is produced by dust particles left behind by comet C/1861 G1 Thatcher, which was discovered in 1861. The meteors appear to radiate from the constellation Lyra. Moon Phase: first quarter 50% that will set at 1:46 a.m.
Worth Shooting? Yes! With the half moon setting after midnight, the Lyrids could definitely put on a good show. Eta Aquarids is an above-average shower that can have up to 30 meteors per hour in the Northern Hemisphere, and up to 60 per hour in the Southern Hemisphere! Its peak is on the evening of May 6 into the early morning of the 7th. It is produced by the dust particles left behind by the famous Halley’s Comet, which has been recorded since ancient times. The meteors appear to radiate from the constellation Aquarius. Best Viewed: from 10 p.m. to 2 a.m. Moon Phase: waning gibbous 59% that will rise at 1:41 a.m.
Worth Shooting? Yes. With no moon to begin the night, you should be able to see the start of the show during clears skies. After 1:30 a.m., only the brightest of the meteors will be visible. The Ruins of Hovenweep. Hasselblad X1D and 30mm f/3.5 lens. Blend of foreground at 6 minutes, f/4, ISO 800 and sky at 23 seconds, f/4, ISO 6400. © Gabriel Biderman. Welcome the Milky Way galactic core someplace dark, as it rises around 11 p.m.! Milky Way Arching over Centennial Valley, Montana. Nikon D750 and 14-24mm f/2.8 lens. Five-image panorama at 30 seconds, f/4, ISO 6400. © Gabriel Biderman. 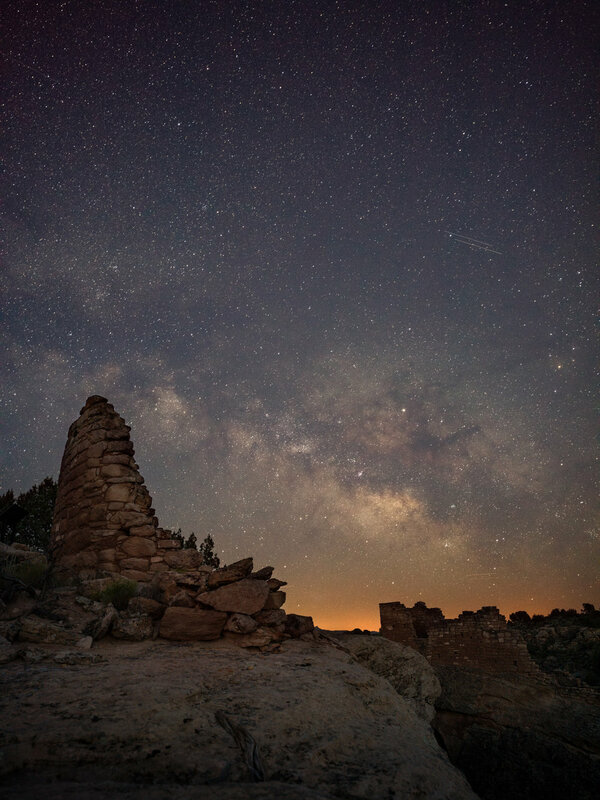 Even better Milky Way core, as it will be up around 9:15 p.m.—during nautical twilight in most of the U.S. Prime time of the year for the Milky Way arching shots! Shortest night of the year. Boo! Under Sipapu, Natural Bridges National Monument. Nikon D750 and 14-24mm f/2.8 lens. 20 seconds, f/2.8, ISO 6400. © Gabriel Biderman. Also on this day is a partial solar eclipse for our friends in southern Australia and Antarctica. 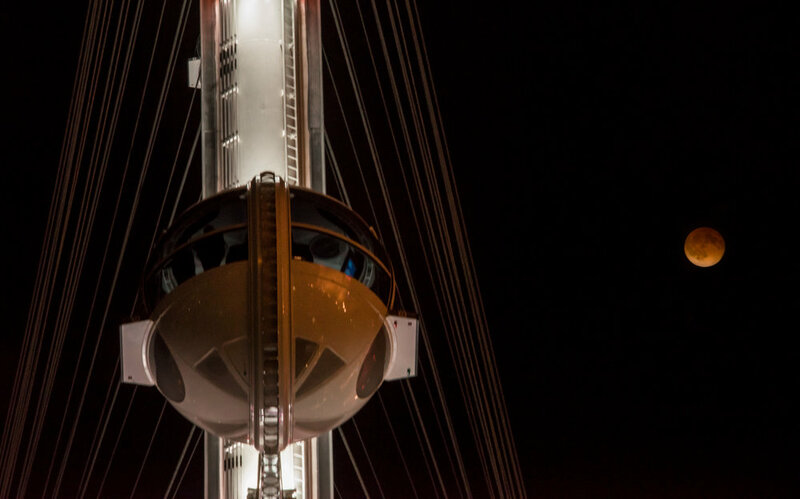 Higher Rolling with the Blood Moon, Vegas 2014. Sony A7r and Nikon 70-200mm f/2.8 lens. 4 seconds, f/11, ISO 800. © Gabriel Biderman. This is an average shower, with 20 meteors per hour during its peak from the evening of July 28 through the early morning of the 29th. These meteors are produced from the debris left behind by the comets Marsden and Kracht, and they appear to radiate from the constellation Aquarius. The August Core over Centennial Valley, Montana. Nikon D750 and 14-24mm f/2.8 lens. 20 seconds, f/2.8, ISO 6400. © Gabriel Biderman. During this new moon, the Milky Way will appear high in the sky immediately as darkness falls. This partial solar eclipse will be seen in parts of northeast Canada, Greenland, extreme northern Europe, and northern and eastern Asia. Best viewing will be in northern Russia with 68 percent of the sun blocked. Great Sand Dunes National Park, Colorado. Nikon D750 and 15mm Zeiss Distagon f/2.8 lens. 234 images at 22 seconds, f/2.8, ISO 6400, plus a single exposure at 382 seconds, ISO 2000 for the landscape after moonrise. © 2017 Matt Hill. One of the best meteor showers of the year, with 60 per hour during its peak on August 12 into the early morning of the 13th. These meteors are produced from the comet Swift-Tuttle, and they appear to radiate from the constellation Perseus. Worth Shooting? Yes, yes, yes! This is our personal favorite meteor shower. Lots of meteors, new moon and comfortable temperatures. So fingers crossed for clear skies, and fire away! The Milky Way core will be visible for only the first three hours of darkness (will set around 11:30 p.m.). Equal parts day and night (the moon and sun will be rising and setting around the same time)which could create some beautiful twilight photos. Also, in the Northern Hemisphere, the nights start to get longer—woohoo! Draconids is a minor meteor shower which averages 10 meteors per hour during the peak of early evening on October 8. The meteors are produced by comet 21P Giacobini-Zinner, which was discovered in 1900. They appear to radiate from the constellation Draco. Worth Shooting? Yes. Even though it is a minor meteor show, no moon means that you’ll see even the faintest meteors in a dark sky location. Milky Way core will be visible for 1 1/2 hours after astronomical twilight. Orionids is an average shower that has about 20 meteors per hour at its peak from late on October 21 until early morning on the 22nd. The meteors are produced from the dust left behind by the prolific Halley’s Comet. They appear to radiate from the constellation Orion. Worth Shooting? Yes. Even though the full moon will block the fainter meteors, the Orionids produce very bright streaks that should be visible throughout the night. Taurids is a minor meteor shower that averages five to 10 per hour, and peaks on the evening of the November 5 into the morning of the 6th. They are produced by Asteroid TG10 and comet 2P Encke, and appear to radiate from the constellation Taurus. Worth Shooting? I wouldn’t make plans around it, but if you happen to be in a dark location with clear skies, be on the lookout. Milky Way core will be visible for approximately the first hour of darkness. Average meteor shower—15 per hour during peak from the evening of November 17 until early morning on the 18th. Produced by the comet Temple-Tuttle, which was discovered in 1865. The meteors appear to radiate from the constellation Leo. Moon Phase: waxing gibbous 72%, setting at 1:36 a.m.
No Core in the Haystack, Oregon 2016. Nikon D750 and 14-24mm f/2.8 lens. 30 seconds, f/2.8, ISO 3200. © Gabriel Biderman. Milky Way core will not be visible during the night in the Northern Hemisphere. It looks like we will witness the 10th closest comet in modern times! It should be viewable to the naked eye on December 12 as it reaches perihelion—its closest approach to the sun. Look toward the bull constellation, Taurus, that night. On December 16, the comet will make its closest approach to Earth, soaring by only 7.1 million miles away, and will be visible to the naked eye. Look toward the Pleiades and Hyades star clusters. For more information, see this breakdown from the University of Maryland. This is probably the best meteor shower for photography, with an average of 120 multicolored meteors during peak from the evening of December 13 until early morning on the 14th. The roaming meteoroids were produced by Asteroid 3200 Phaethon, which was discovered in 1982, and the meteors appear to radiate from the constellation Gemini. Moon Phase: waxing crescent 36%, and sets around 10:30 p.m.
Worth Shooting? If you can find someplace not too cold and have clear skies—YES, YES, YES! Longest night of the year!!! Warning—Northern Hemisphere nights start to get shorter after this. Ursids is a minor meteor shower—with an average of five to 10 per hour from the evening of the December 21 until the early morning of the 22nd. Produced by the comet Tuttle (discovered in 1790), the meteors appear to radiate from the constellation Ursa Minor. Worth Shooting? Probably not—with the full moon up the entire night, likely cold temperatures and not many bright meteors, I’d sit this one out. Phew! That about sums up the top celestial events to photograph in 2018. I hope this inspires you to seize the night in the upcoming year! As you do, remember that we love to see your night images! Feel free to share them on our Facebook page, or to tag us in Instagram. We always love looking, we will always respond, and we are eager to share in more and more conversations about night photography.